Plasma membrane-associated small GTPase which cycles between an active GTP-bound and an inactive GDP-bound state. In active state binds to a variety of effector proteins to regulate cellular responses. Involved in epithelial cell polarization processes. Regulates the bipolar attachment of spindle microtubules to kinetochores before chromosome congression in metaphase. Plays a role in the extension and maintenance of the formation of thin, actin-rich surface projections called filopodia. Mediates CDC42-dependent cell migration. 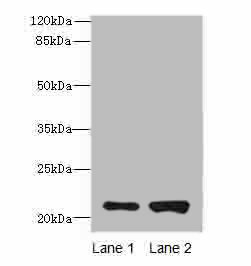 CDC42 Polyclonal Antibody. Unconjugated. Raised in: Rabbit.